I made these for 2003 using a spice cake mix and some pumpkin in place of eggs and some oil, and it was pretty good considering it came from a mix. However, I’m being more conscientious with ingredients now so I also have a super yummy from-scratch recipe for you. This one is *slightly* low-sugar, and truly low-sugar if you go frosting-free. Because we’re all busy shoveling candy into our mouths around this time of year, low-sugar recipes should be a staple in everyone’s kitchens. But don’t worry, it doesn’t taste low-sugar unless you eat it without frosting and even then it’s just not cavity-aching sweet. As a confirmed sugar junkie, you have my word. Preheat the oven to 350F. Grease and flour two 8 inch cake pans. In large bowl cream the soy margarine and sugar until light and fluffy (about 2-3 minutes). Add the egg replacer and mix well. Add the pumpkin puree and vanilla and beat until incorporated. In a separate bowl, whisk together the flour, baking soda, baking powder, salt and spices. Add the flour mixture and soy buttermilk alternately to the pumpkin batter, in three additions, beginning and ending with the flour mixture. Pour the batter into the prepared pans and bake for approximately 30 minutes, or until a toothpick inserted in the middle comes out clean. Cool for 10 minutes and then invert and remove the cakes from their pans. Cool completely before frosting. I’m really not in love with any particular frosting, but I have some suggestions. To make this a full fledged low-sugar desert, you can use this refined-sugar-free (yet astoundingly delicious) recipe called Date Butter Frosting. I added coconut flakes instead of extract (since that’s what I had in my kitchen) and it was REALLY good. Another healthy yet decadant alternative is made with about 1 C raw nuts (cashew or whatev), 2 handfuls dates, carob or cocoa to taste, and a little fresh lemon juice and water. Oh WOW is that stuff good, and carob/cocoa goes so well with pumpkin. (You could then make the Pumpkin King design with powdered sugar.) If your idea of frosting is that “pourable” bizness, you might not appreciate these recipes. Everyone else, rejoice in the natural sweetness of dates! For the sweet teeth in the audience, and I must confess that I often fall into this category, you will want a cream cheese flavored frosting. Here’s one called Tofu Cream Cheese Frosting and another that is just called Cream Cheese Frosting. (Any kind of non-dairy cream cheese will do in that second recipe: it doesn’t have to be rice.) If you’re new to the whole “baking without animal-based secretions” thing, don’t be frightened! These recipes are all really good and taste marginally or no different than their non-vegan counterparts. You can even make your own dairy-free cream cheese and concoct your own recipe from there. Get creative, and make me proud! First frost your cake and let it sit for a little while so that the frosting forms a little skin. If it’s very wet the stencil will stick to it and try to ruin your design. You’ll then need the "Pumpkin King" stencil from Zombie Pumpkins. Trace that design onto some wax paper (or "freezer paper") and cut out the black pieces. Take your new stencil and lay it, shiniest side down, onto the top of the cake. Push lightly around the edges to get it to lightly adhere. Shake some colored sugar sprinkles (or something else if you’re feeling creative) onto the cake until there is a layer of sugar on every frosted surface. Carefully peel off the stencil, taking your time with the severe angles of the mouth. To transport the cake (because this knocks the socks off co-workers, family, kids, and party-goers alike) place some short toothpicks or thin skewers into the cake at 3-5 spaced out intervals, and then delicately mold the aluminum foil around the cake and plate. 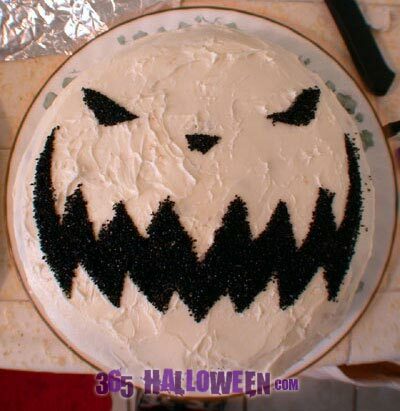 create your own Halloween Pumpkin Cake Recipe. 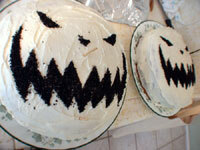 Subscribe to comments with RSS or TrackBack to 'Halloween Pumpkin Cake Recipe'. I intend to try this for the pumpkin half of a pumpkin chocolate vegan marble cake… my theory is to marble 2 great vegan recipes and see how it goes. I’m taking it for Thanksgiving with my southern family, so if I will pull off the flavor, this will be a huge accomplishment. They are used to dairy and meat dishes. I am curious if you used 100% whole wheat flour, spelt, or a combination? I didn’t think I could get away with wheat flour for this cake, but if I can that would be even better! This was SO delicious!! I have baked “healthy” desserts all month and this one was the ONLY one that has tasted good so far! Amazingly moist, fluffy, just the right amount of sweetness. Thanks for sharing! 365 Halloween Response: Mmm almond extract. Sounds like a wonderfully simple and yummy frosting. Nobody ever guesses this cake is dairy and egg free so it makes a great sneaky-vegan recipe. Congrats on winning the contest! great recipe! i had some canned pumpkin i was looking to get rid of and this turned out good! i kicked up the spices a little bit, adding a little more than suggested, and added dry mustard. delish. also, i’ve found it’s not totally necessary to curdle the soymilk. i usually add vinegar as the very last ingredient in vegan cakes. don’t know if this is scientifically better or worse than doing it the faux buttermilk way, but that’s just how i’ve been doing it for years! thanks for the recipe! 365 Halloween Response: Hmm, I’ve always wondered about the timing of vinegar to get proper curdling. Good to know that it can be added whenever. Thanks also for letting us know about your delicious experience with this recipe! Could I replace pumpkin with the “eggs” in this cake too? Our response: While I can’t totally stand behind the suggestion- not having tried it myself- I think it would work fine. Fruit puree (traditionally applesauce or mashed bananas) is used in baking as an egg substitute, but pumpkin puree is more dense, so I imagine it would create a more dense cake. Definitely worth a try though, for extra pumpkin yuminess! If you try it, please let us know what your results are. how long do you let the vinegar curdle with the soymilk? Minutes, hours, days?? Thanks! 365 Halloween Note: It usually doesn’t take more than 5 minutes, but just eyeball it. When it gets thicker and looks rather disgusting, it’s ready!